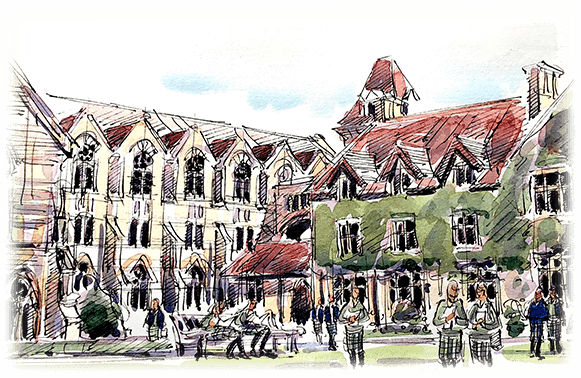 Our education consultants frequently review the UK’s leading independent schools. In this article, we recap on our visit to Marlborough College. Marlborough College was founded by a group of Church of England clergymen in 1843, with the purpose of educating the sons of clergy. Today, the college is an outstanding co-education boarding and day school. If you are considering sending your son or daughter to Marlborough College, our education consultants offer independent and expert advice to help you select the right school for your child. To speak to one of our education consultants, please call us today or use the enquiry form further down this page. Our guides were two upper 6th boys who were charming and happy to answer any questions; one a classicist who was applying for Oxford, whilst his companion was studying Spanish, History and Music for A level. First we went to the Art Schools which were very spacious and light where there were GCSE pupils busy working on portraits; In the Maths School and the Science building we saw ‘one to one’ lessons going on for senior pupils. The Languages department was full of bustle, we discovered that in the shell year (year 9) pupils get a chance to try out six different languages including Arabic and Mandarin in a ‘Language Circus’ before they have to decide which two they want to take for GCSE. Next stop was a state of the art 25 metre indoor swimming pool. It has a hydraulic floor which enables the depth to go from 0.8 to 3 metres so that it can be used for sub aqua sport as well as canoeing, water polo and swimming. Outside the pool complex we saw the outdoor all weather astro pitches for hockey. Our two guides were feeling the pressure of having to get us around a plethora of impressive facilities and back in time of the first of House tours. They showed us the Hony Centre which houses the School Theatre, Music Technology and Performance Arts and the enormous communal dining room where the school eat together. We peeked inside the beautiful chapel whilst skirting around the Mound under which Merlin is allegedly buried! There are 15 Boarding Houses, five all girls, six all boys and four ‘mixed Houses’ which have boys from 13 who are joined by girls coming in for the V1 form. Two girls from New Court took us to their House which is in the old stable block built around a court yard which houses a private garden used for barbecues in the summer. In the Shell year (year 9) girls share dormitories with three others and have dedicated studies where a senior girl has a desk and supervises prep each day. By the sixth form girls have individual rooms. The dormitories are arranged so that year groups are integrated which is intentional. Sally Shearn, the House Mistress wants to create a friendly environment for the girls without hierarchy. She described her role as the best job in world and spoke passionately about pupils at New Court and their achievements. Our guides were engaging and were clearly very at home. Next we visited Mill Mead, a popular girls House a few minutes from the campus hub, recently refurbished it also houses C3, a boys house on the opposite side of the entrance atrium. The House mistress and first XI hockey coach is a human dynamo full of energy and passionate about Mill Mead, where girls are encouraged to get out of their comfort zone and give things a go. The shells share dorms on the ground floor in an effort to enable them to get to grips with House life and to bond as a group in the first year. Our friendly guides showed us ‘brew’ rooms where pupils can make snacks and enjoy a chat. In the Memorial Hall, we were greeted individually by Jonathan Leigh, the Head who is known as ‘the Master’. This semi-circular auditorium seats 800 and was built to commemorate the 749 Marlburians who lost their lives in the first world war. All of their names are carved in panels at the back of hall in alphabetical order without reference to their rank. Soft spoken and eloquent, Mr Leigh described Marlborough as much more than a school: ‘it is a way of life’. The House system is at its heart where residential happiness in the Houses drives the community in the college, describing the 15 Houses as ‘the parishes of the school’. ‘Relationships really matter if you want things to work’. Boarding at Marlborough offers enormous scope for co-curricular activity, so weekends are really full, the school does not empty out. He wants to see pupils have a triple A experience – with Academics being the cornerstone alongside the Arts and Athletics. Mr Leigh discussed how, ‘teens need optimism and encouragement to flourish’. At Marlborough they get the ‘3 Rs’: Rigour, Responsibility and Respect. They are expected to ‘join in’ and to develop a global perspective fit for an increasingly complex world outside. Mr Leigh didn’t crow but he was clearly proud of the impressive results with 64% achieving A* at A level last summer and 22 (just over 10%) winning places to Oxbridge, as well as 80% of leavers achieving their first choice of courses at Russell Group universities. Together with his leadership team, his attention is on the evolving education process and on developments in relation to linearity in the exam system which offers pupils the chance to study for IB, Pre-U and/or A-level. His manner was calm and confident which inspired both parents and children, aiming for the highest standards in all areas of school life. Dr. Hamilton, Head of Admissions explained the process carefully and encouraged the children to impress the Head at their current school because their reference accounted for 50% of the entrance test. There is a computer test which accounts for 10%, and two interviews with House masters or mistresses as well as an interview with a tutor, Marlborough wants to be sure that applicants are really what the reference says about them. The application includes a form to be completed by the potential pupils themselves. We enjoyed a delicious lunch with all the other families in the company of the Heads of departments who were available to chat and answer questions, the atmosphere was relaxed, warm and informative. Leaving Marlborough, there was a sense that there was still more to see and a desire to return and discover more about it. We were glad to have made the trip. Our education consultants offer independent advice to help you find the right senior school for your family's aspirations and your child's interests and ambitions. For more information about this service, please visit our Senior School Consultants page. If you are considering sending your son or daughter to Hampton Court House School, please read our independent review to determine whether it is suited to their personality and learning style. Find out more about The Halcyon London International School in this independent review by one of our education consultants.